Florence (Italian: Firenze, Old Italian: Fiorenza, Latin: Florentia) is the capital and most populous city of the Italian region of Tuscany, and capital of the province of Florence. From 1865 to 1870 the city was also the capital of the Kingdom of Italy. The Italian language stems from the Florentine dialect. Florence has a legacy that spans more than 2000 years. Initially a small city of moneylenders and textile merchants, with little political or military power, Florence became a bustling center of European trade and finance. From the Middle Ages it exerted substantial influence throughout Italy and the European continent. In the fourteenth century, the city's florin, a coin containing 3.5 grams of gold, became the dominant trade coin of Western Europe, replacing heavier silver bars. Known for art and architecture, it is considered the birthplace of the Italian Renaissance. Leonardo da Vinci, Michelangelo, Donatello, Raphael, Dante, political theorist Machiavelli, astronomer Galileo, the Medici family, which ruled the city for generations, navigator Amerigo Vespucci, and humanitarian Florence Nightingale all called Florence home. 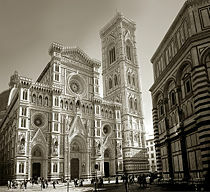 The historic center of Florence attracts millions of tourists each year. It was declared a World Heritage Site by the UNESCO in 1982 for its "600 years of extraordinary artistic activity." Modern Florence is a testimony to its past. Its buildings are works of art, housing yet more works of art, reflecting the personalities and passions of those who created them. The name Florentia derives from a Roman family name which itself was derived from the name Florentius, meaning "blossoming." Fiesole, in the hills north of Florence, was an ancient stronghold of the Etruscans, whose presence in the region provides the name Tuscany. Florence, which is located 174 miles (280 km) north of Rome in a basin between the Senese Clavey Hills, lies on Arno river and three other minor rivers, and is surrounded by hills covered with villas, farms, vineyards, and orchards. The city covers an area 39 square miles (102 square kilometers) and is at an elevation of 164 feet (50 meters). Florence is sometimes classified as having a Humid subtropical climate, with hot, humid summers with little rainfall and cool, damp winters. The average maximum temperature in July is around 88°F (31°C), and in January is 50°F (10°C). Winter has occasional snow. Mean annual precipitation is 36 inches (912mm). Environmental issues have resulted from the city's economic growth, which has meant urbanization and motor vehicle traffic has intruded on the beautiful countryside of Tuscany. Florence had a high level of air pollution and traffic congestion in 2008. Statue of Giovanni Villani, who was inspired to write a history of Florence after attending jubilee festivities in Rome in 1300. 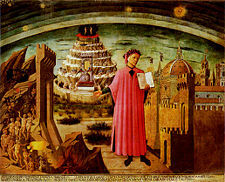 Dante and the Divina Commedia. Florence was originally established by Julius Caesar in 59 B.C.E. as a settlement for his veteran soldiers. It was named Florentia and built in the style of an army camp with the main streets, the cardo and the decumanus, intersecting at the present Piazza della Repubblica. Situated at the Via Cassia, the main route between Rome and the North, and within the fertile valley of the Arno, the settlement quickly became an important commercial center. Emperor Diocletian (244-311 C.E.) made Florentia the capital of the province of Tuscia in the third century. Saint Minias was Florence’s first martyr, who was beheaded around 250, during the anti-Christian persecutions of the Emperor Decius. According to legend, Minias picked up his disembodied head and walked across the Arno River and up the hill Mons Fiorentinus to his hermitage, where the Basilica di San Miniato al Monte now stands. The seat of a bishopric from around the beginning of the fourth century, the city underwent turbulent periods of Ostrogothic rule, during which the city was often troubled by warfare between the Ostrogoths and the Byzantines, which may have caused the population to fall to as few as 1000 people. Peace returned under Lombard rule in the sixth century. 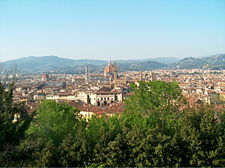 Conquered by Charlemagne in 774, Florence became part of the duchy of Tuscany, with Lucca as capital. Population began to grow again and commerce prospered. In 854, Florence and Fiesole united. Margrave Hugo (950-1001), who was the Margrave of Tuscany from 961 until his death, chose Florence as his residence around 1000. This initiated the Golden Age of Florentine art. In 1013, construction began on the Basilica di San Miniato al Monte. The exterior of the Battistero di San Giovanni was reworked in Romanesque style between 1059 and 1128. This period also saw the eclipse of Florence's formerly powerful rival Pisa (defeated by Genoa in 1284 and subjugated by Florence in 1406), and the exercise of power by the mercantile elite following an anti-aristocratic movement, led by Giano della Bella, that resulted in a set of laws called the Ordinances of Justice in 1293. Of a population estimated at 80,000 before the Black Death of 1348, about 25,000 are said to have been supported by the city's wool industry. In 1345, Florence was the scene of an attempted strike by wool combers (ciompi), who in 1378 rose up in a brief revolt against oligarchic rule. Florence came under the sway, from 1382 to 1434, of the Albizzi family, who were bitter rivals of the Medici. Cosimo de' Medici (1389-1464) was the first Medici to control the city from behind the scenes. Although the city was a democracy of sorts, his power came from a vast patronage network, an alliance with new immigrants, the gente nuova, and from being bankers to the pope. Cosimo was succeeded by his son Piero, and shortly thereafter by Cosimo's grandson, Lorenzo in 1469. Lorenzo (1449-1492), known as "Lorenzo the Magnificent" (Lorenzo il Magnifico), was a great patron of the arts, commissioning works by Michelangelo, Leonardo da Vinci and Botticelli. Lorenzo was also an accomplished musician and brought some of the most famous composers and singers of the day to Florence, including Alexander Agricola, Johannes Ghiselin, and Heinrich Isaac. When the French king Charles VIII (1470-1498) invaded northern Italy, Lorenzo's successor Piero II initially resisted, but had to accept the humiliating conditions of the French king. These made the Florentines rebel and they expelled Piero II. With his exile in 1494, the first period of Medici rule ended with the restoration of a republican government. The Dominican monk Girolamo Savonarola (1452-1498), who became prior of the San Marco monastery in 1490, was famous for lambasting what he viewed as widespread immorality and attachment to material riches. He defined the exile of the Medicis as punishment by God, and carried through political reforms leading to a more democratic rule. But Savonarola publicly accused Pope Alexander VI (1431-1503) of corruption, and was banned from speaking in public, then excommunicated. The Florentines, tired of his extreme teachings, turned against him and arrested him. He was convicted as a heretic and burned at the stake on the Piazza della Signoria on May 23, 1498. Another Florentine, realist political theorist Niccolò Machiavelli (1469-1527), was commissioned by the Medici to write the Florentine Histories. 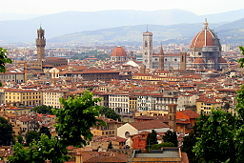 Florentines drove out the Medici for a second time and re-established a republic on May 16, 1527. The Medici in 1537 became hereditary dukes of Florence, and in 1569 Grand Dukes of Tuscany, ruling for two centuries. 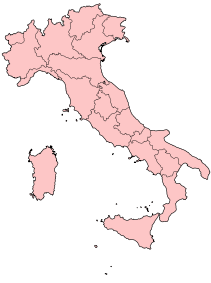 In all Tuscany, only the Republic of Lucca (later a duchy) and the Principality of Piombino were independent from Florence. The extinction of the Medici line and the accession in 1737 of Francis Stephen (1708-1765), duke of Lorraine and husband of Maria Theresa of Austria (1816-1867), led to Tuscany's temporary inclusion in the territories of the Austrian crown. Tuscany became a province of the United Kingdom of Italy in 1861. Florence replaced Turin as Italy's capital in 1865, hosting the country's first parliament, but was superseded by Rome six years later, after the withdrawal of the French troops. After doubling in size during the nineteenth century, Florence's population tripled in the twentieth century with the growth of tourism, trade, financial services and industry. During World War II (1939-1945) the city experienced a year-long German occupation (1943-1944) and was declared an open city. The Allied soldiers who died driving the Germans from Tuscany are buried in cemeteries outside the city (Americans about 9 kilometers (6 mi) south of the city , British and Commonwealth soldiers a few kilometers east of the center on the right bank of the Arno. At the end of the nineteenth century, the Florence city administration razed the Old Market Square, in favor of a new square, the Piazza della Repubblica, dedicated to Victor Emmanuel II, arguing that the area had decayed from its original medieval splendor. The new square is the location of the literary café Giubbe Rosse, a place where the Futurist movement blossomed, and which publishes books of famous Italian authors such: Mario Luzi, Manlio Sgalambro, Giovanni Lista, Menotti Lerro, Leopoldo Paciscopi. In November 1966, the Arno river flooded parts of the center, damaging many art treasures. There was no warning from the authorities who knew the flood was coming, except a phone call to the jewelers on the Ponte Vecchio. Around the city there are tiny placards on the walls noting the highest points the flood waters reached. Italy is a republic in which the president is chief of state who is elected by an electoral college for a seven-year term. The prime minister, who is head of government, is appointed by the president and confirmed by parliament. The bicameral Parlamento consists of a senate of 315 members, and the chamber of deputies of 630 members, both houses elected by popular vote to serve five-year terms. The city, or comune, of Florence is the capital of the Tuscany region, which is one of Italy's 20 regions, and of the province of Florence. Italy's 100 provinces have their own local elections. Each province has a prefect who is appointed by and responds to the central government, which he locally represents. The comune provides many basic civil functions. It has a registry of births and deaths, a registry of deeds, and it contracts for local roads and public works. It is headed by a mayor (sindaco) assisted by a council of aldermen, the Consiglio Comunale. The offices of the comune are housed in a building usually called the Municipio, or Palazzo Comunale. The Italian 'florin' was struck from 1252 to 1523 with no significant change in its design or metal content standard. It had 54 grains of gold (3.5g). The "fiorino d'oro" of the Republic of Florence was the first European gold coin struck in sufficient quantities to play a significant commercial role since the seventh century. Many Florentine banks were international companies with branches across Europe, and the florin quickly became the dominant trade coin for large scale transactions, replacing silver bars in multiples of the mark (a weight unit equal to eight ounces). In the fourteenth century, 150 European city-states and local coin issuing authorities made their own copies of the florin. Florence is regarded as the birthplace of Italian fashion, since the 1951-1953 soirées held by Giovanni Battista Giorgini are considered the beginning of the Italian school. The city is home to the legendary Italian fashion establishment Salvatore Ferragamo. Many others, most of them now located in Milan, were founded in Florence. Gucci, Prada, Roberto Cavalli, and Chanel have large offices and stores in Florence or its outskirts. Today Florence depends on tourism, although an information technology sector has developed, and the region around the city has a modern economy based on small industrial production. Certain textile industries employing largely immigrant populations can be found to the north and northwest of the city, continuing its long tradition as a center of fine fabrics. The city is part of an industrial district extending to Prato and Pistoia. Manufacturing in the industrial suburbs includes the production of furniture, rubber goods, chemicals, and food. Goldsmiths, silversmiths, and jewelers have manufacturing stores on the Ponte Vecchio bridge, a symbol of Florence. Food and wine have long been an important staple of the economy. Tuscany is one of the great wine-growing regions in the world. The Chianti region is just south of the city, and its Sangiovese grapes figure prominently not only in its Chianti Classico wines but also in many of the later-developed Supertuscan blends. Within 20 miles (32km) to the west is the Carmignano area, also home to flavorful sangiovese-based reds. The celebrated Chianti Rufina district, geographically and historically separated from the main Chianti region, is also few miles west of Florence. The Bolgheri region (about 100 miles/200 kilometers southwest of Florence) has become celebrated for its "Super Tuscan" reds such as Sassicaia and Ornellaia. Florence’s location at the connecting point of transport lines connecting northern and southern Italy has reinforced its role as a market center. The center of the city is closed to through-traffic, although buses, taxis and residents with appropriate permits are allowed in. Walking remains the best way of getting around in the central city. Due to the high level of air pollution and traffic congestion in the city, an urban tram network called the TramVia was under construction in 2008. Long distance buses are run by the SITA, Copit, CAP and Lazzi companies, which also accommodate travelers from the Amerigo Vespucci Airport, which is 3.1 miles (5km) west of the city center. Inside the principal railway station of Florence, Santa Maria Novella. In 2006, there were 366,488 people residing within Florence's city limits, while the Metropolitan Area of Florence, Prato, and Pistoia, was home to about 1.5 million people. In the five years between 2002 and 2007, the population of Florence grew by 3.22 percent, while Italy as a whole grew by 3.56 percent. As of 2006, 90.45 percent of the population was Italian. The largest immigrant group, which came from other European countries (mostly from Albania and Romania), constituted 3.52 percent, East Asia (mostly Han Chinese and Filipino made up 2.17 percent, the Americas 1.41 percent, and North Africa] (mostly Moroccan) 0.9 percent. Florentine (Fiorentino), spoken by inhabitants of Florence and its environs, is a Tuscan dialect and an immediate parent language to modern Italian. Many linguists and scholars of Dante, Boccaccio, and Petrarch consider standard Italian to be, in fact, modern Florentine. Its vocabulary and pronunciation are largely identical to standard Italian, though the hard c [k] between two vowels (as in ducato) is pronounced as a fricative [h], similar to an English h. This gives Florentines a distinctive and highly recognizable accent (the so-called gorgia toscana). 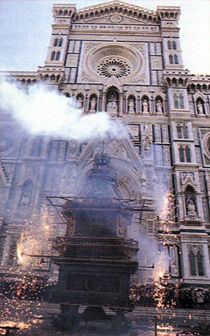 Most Florentinos are Roman Catholic. Every year on June 24, citizens dress up, parade, dance, and celebrate the city's biblical patron, John the Baptist. Just as Christian theology considers John to be the herald of the coming Messiah and the age of the Kingdom of God, so medieval Florence considered itself to be at the threshold of a new age for humanity. The University of Florence (Università degli Studi di Firenze, UNIFI), which evolved from the Studium Generale, established by the Florentine Republic in 1321, is one of the largest and oldest universities in Italy. It consists of 12 faculties and had about 60,000 students enrolled in 2008. The Uffizi and Palazzo Vecchio, the town hall of Florence. 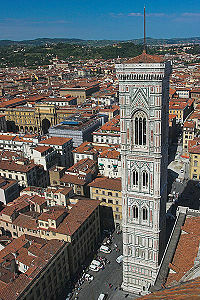 Facade and Campanile (bell tower) of Santa Maria del Fiore. The Baptistery can be seen in the right foreground. Florence has an exceptional artistic heritage and is known as the “Cradle of Renaissance.” Cimabue and Giotto, the fathers of Italian painting, lived in Florence, as well as Arnolfo and Andrea Pisano, renewers of architecture and sculpture, Brunelleschi, Donatello and Masaccio, who were forefathers of the Renaissance, as were Ghiberti and the Della Robbias, Filippo Lippi and Angelico. The city was also home to Botticelli, Paolo Uccello, as well as Leonardo da Vinci and Michelangelo. Florence has a distinctive cuisine, which derives from peasant eating traditions, and features antipasti, that includes crostini toscani, sliced bread rounds topped with a chicken liver-based pâté, and sliced meats (mainly prosciutto and salami, often served with melon). The most famous main course is the bistecca alla fiorentina, a large 1.3 pound (600 gram) T-bone steak of Chianina beef cooked over hot charcoal and served very rare. Most food is served with local olive oil, also a prime product enjoying a worldwide reputation. The domed Santa Maria del Fiore cathedral, known as The Duomo, is the best-known site and crowning architectural jewel of Florence. The magnificent dome was built by Filippo Brunelleschi, the nearby Campanile tower (partly designed by Giotto) and the Baptistery buildings are also highlights. At the heart of the city in Piazza della Signoria is Bartolomeo Ammanati's Fountain of Neptune (1563-1565), which is a masterpiece of marble sculpture at the terminus of a still functioning Roman aqueduct. The Ponte Vecchio (Old Bridge), whose most striking feature is the multitude of shops built upon its edges, held up by stilts. The bridge also carries Vasari's elevated corridor linking the Uffizi to the Medici residence (Palazzo Pitti). First constructed by the Etruscans in ancient times, this bridge is the only one in the city to have survived World War II intact. The Church of San Lorenzo contains the Medici Chapel, the mausoleum of the Medici family. The Uffizi Gallery, near the Basilica di San Lorenzo, is one of the finest art museums in the world, and was founded on a large bequest from the last member of the Medici family. 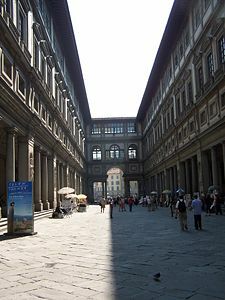 The Uffizi ("offices") itself has been the center of Florence civil life and government for centuries. Signoria Palace is still home of the community government, and the Loggia dei Lanzi was where public ceremonies of the republican government took place. In 1301, Dante was sent into exile from there. In 1497, it was the location of the Bonfire of the Vanities instigated by the Dominican friar and preacher Girolamo Savonarola, and on May 23, 1498, the same Savonarola and two followers were hanged and burned at the stake there. The Bargello art museum concentrates on sculpture, containing many priceless works of art created by such sculptors as Donatello, Giambologna, and Michelangelo. 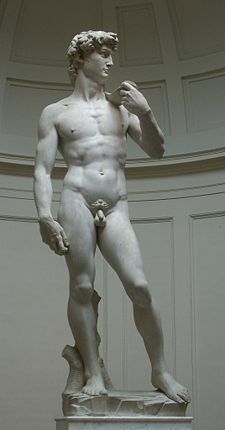 The Accademia dell'Arte del Disegno collection's highlights are Michelangelo's David and his unfinished Slaves. The Pitti Palace contains part of the Medici family's former private collection, as well as a large number of Renaissance works, including several by Raphael and Titian as well as a large collection of modern art, costumes, cattiages, and porcelain. Adjoining the palace are the Boboli Gardens, elaborately landscaped and with many interesting sculptures. The Santa Croce Basilica, originally a Franciscan foundation, contains the monumental tombs of Galileo, Michelangelo, Machiavelli, Dante (actually a cenotaph), and many other notables. The Scoppio del Carro (“Explosion of the Cart”), which takes place every Easter Sunday, celebrates the First Crusade (in 1095). Calcio Storico Fiorentino' (“Historic Florentine Football”), sometimes called Calcio in costume, a traditional sport, regarded as an forerunner of soccer, which originated in the Middle Ages, when the most important Florentine nobles amused themselves playing while wearing magnificent costumes, is played in the Piazza di Santa Croce during late June and early July each year. Despite problems associated with largely unplanned growth over centuries, and a high level of air pollution and traffic congestion, Florence has a huge legacy. The city stands on more than 2000 years of history, is known for its art and architecture, and was a center of medieval European trade and finance. The city is often considered the birthplace of the Italian Renaissance, and has been called the Athens of the Middle Ages. This legacy, with its famous buildings and status as a World Heritage Site, plus a world-wide reputation for food and wine, means Florence should continue to attract millions of tourists every year. ↑ The Amerigo Vespucci Committee. Florence American Cemetery and Memorial Retrieved October 28, 2008. ↑ Veterans UK. Remembrance Retrieved December 28, 2007. ↑ Winepros. Oxford Companion to Wine: Bolgheri Retrieved October 28, 2008. ↑ ISTAT.Italy Retrieved October 28, 2008. ↑ Annenberg Media. Florentine Art and Architecture Retrieved October 28, 2008. ↑ ThinkQuest.org. Renaissance Artists Retrieved October 28, 2008. ↑ Tuscany Guide. Olive oil and Tuscany production Retrieved October 28, 2008. This page was last modified on 13 April 2017, at 15:17.